Are there leaderboards for the different challenges? It didn't sound like it, but it's something I expect for a game like this, especially a $15 one. Doesn't look that great to me. They don't get to the actual "remixed" challenges until 19 minutes in. I don't know what I was expecting, but I wasn't expecting so many "just get past this part of this game you've played before". Maybe it's fun for newcomers, but we've played these before. Doesn't look worth $15, TBH. I thought it looked like a lot of fun for about five bucks, but at 15 it better have a crapload of content or replay appeal. I'm weak and got this since I had $15 in deluxe promotion credit just chilling anyways. So far it's been pretty fun. I've made it through the 8/23 SMB challenges & the first 6 remix challenges, and they're steadily increasing in difficulty. Especially if you're a perfectionist like me who HAS to get the perfect score before moving onto the next one. How many challenges would you say are in the game total? And how long is each challenge? Most have 10, but the 2 DK games only have 7 while Super Mario Bros. has 23. There are 25 Remix stages that you slowly unlock while gathering stars from completing the other challenges. Though, there's one slot on the game select screen that's still empty, and seeing as the first 25 challenges are titles Remix I, I'm going to guess that slot will be Remix II. On a perfect run, most challenges have taken about 1 or 2 minutes I'd say. Think of them like slightly extended Wario Ware games where most challenges contain 3 or 4 stages. Like one Super Mario Bros. challenge gives you task of hitting the correct block to reveal the vine. You do this for 3 stages and then the challenge is complete. Hopefully that makes semi-sense, I'm kinda rushing through this before I head out the door, heh. Are there at least local leaderboards or does it just save your highest score? But look at how much FUN they're having! The game has to be good! 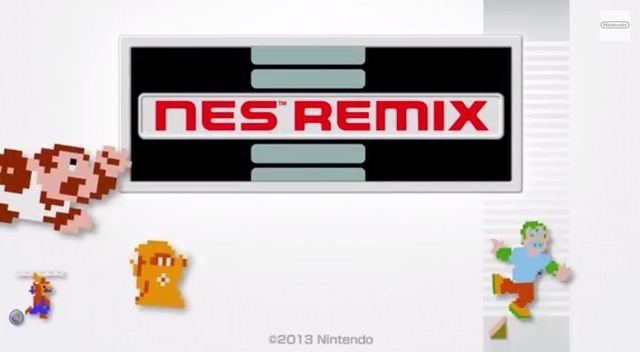 ...It looks like NES Nintendo Land. Could be interesting. I want more impressions! Buying later, I better still have 15 bucks there, grr. So this game has a lot more depth to it than I thought. You can collect up to 3 stars per challenge, and as you collect more, you unlock more games which each have their own set of challenges. I glanced at a stream of the game earlier and the guy had over 400 stars, meaning more than 133 challenges, and he still had more to unlock. Then on top of that there's the fact that you'll get a rainbow glow around the 3 stars if you beat that challenge under a specific time, which for some of these seems to require flawless runs. This looks interesting, and it sure came out of nowhere. If I get a Wii U at some point, I'll look into this game. I can't believe there are no leaderboards.. Maybe there just aren't leaderboard "right now?" I mean, the game has been out for 9 hours, haha. @Mr_Mustache I can't see Nintendo of all companies adding in functionality shortly after a game's release, because they were too strapped for time prior to the initial release. Didn't they add leaderboards and stuff for Pikmin 3? Leaderboards were always there in Pikmin 3, they just added more stages into the mix with DLC (each of which had their own leaderboards as well). Welp, in any event, eShop account permitting (regretting my buying spree last week...lets do some math; I started around 26 something, bought the newest Pikmin DLC, and then the Batman Origins Prequel stuff...grrr, I have no idea..), I'll own this in 2 hours. I like the idea of it, I'm excited at the prospect of it, and I will..relish the..playing? I've put 4 hours into the game and have 216 stars, with only 2 games' challenges completely finished.